The 2 Pink Ladies: Cricut Imagine! Oh my goodness!! We are soooo excited! Both myself and my mother has purchased the new Cricut Imagine! We are part of an exclusive Imagine "club". (not really a club, but it sounds good). LOL! We just couldn't pass it up for all you get with the machine. 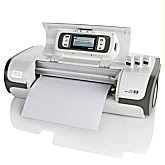 Included in this purchase: The Cricut Imagine, three Imagine cartridges, the matt, ink, a 12x12 sheet of cardstock and also a printable 12x12 vinyl sheet. This will never, NEVER, be offered as this package again. It is well worth the price of $499.00 free shipping. We cannot wait to show you all it can do. We have so many projects to come up with to share with you. So please check in often. I think we need to have a special day every week that focuses on the Cricut Imagine. I think maybe Friday and we can call it Imagine Fabulous Friday. I'll have to check with my co-blog owner to see what she thinks. We will let you know when we get the machine in. Can't wait!!! !